What an amazing experience. My recent trip to Siberia, for the second leg of the Euclid Network PeerEx exchange, far surpassed expectations and well and truly dispelled the myths – there were no gulags and it wasn’t -40 degrees! In fact it was spring so only just below freezing most of the time. I arrived in trepidation into Novosibirsk, Siberia, having briefly and bizarrely crossed paths with my husband for an hour at Moscow Airport (I was flying out, whilst he was flying home from a trip to Kazan). What are the chances of that?! My exchange partner Irina Makeeva made me feel so welcome. Both she and her ten year old son Kuzma (who was keen to chat in English) gave me huge hugs when I arrived. I think our chatting in the taxi to the hotel was a bit fast for him as he apparently only understood the word ‘recipe’ on the whole journey – so started the food focus of my trip! Novosibirsk is 4 hours ahead of Moscow (which is 3 hours ahead of UK) so the added jet lag was probably going to be an issue too. They have mitigated their risks through trying to diversify and build income generation models. They have bought their own premises (building ownership seems to be an important part of NGO business practice in Russia), but they are also more reliant on Government funding as a result of the situation. My first day was spent initially having a look at the sights of the city. It is actually the third largest city in Russia (after Moscow and St Petersburg). It grew due initially to being on the Tran-Siberian railway line, and its distance from Moscow attracted a national relocation of people and services in the 1950s due to the threat of Nuclear War. The city has a lovely centre with an opera house and old giant statues of Lenin, some revolutionary soldiers and workers in the central Red Square. Myth has it that it is also the centre of Russia – but many places claim this. 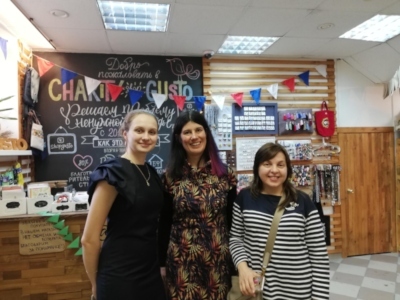 We then went on to spend the day with Irina’s colleagues at the Siberian Resource Centre, to hear about the work that they are doing to support NGOs across the region. 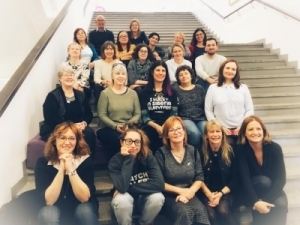 It was set up just after the fall of Communism in 1994/5 by three visionary women who identified the need to work with government to coordinate support and training for fellow NGOs (as well as an element of quality standards). Funding comes from a variety of sources, but they have challenges, especially more recently when they fell foul of government suspicion about the activities of foreign funded NGOs, and were declared ‘foreign agents’. The label was only removed once all foreign funding was sent back. This also led to a suspicion of me, from the authorities, I later learned…. They have however mitigated their risks through trying to diversify and build income generation models. 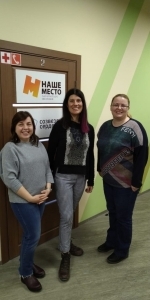 They have bought their own premises (building ownership seems to be an important part of NGO business practice in Russia), but they are also more reliant on Government funding as a result of the situation. In the evening we went out for a lovely dinner with the whole Resource Centre team. The Siberians make fine salads and I was amazed at the diversity of what was on offer. I was told that due to the food embargos there is now a good market in ‘Polish’ cheese (French repackaged in Poland) and Belarussian Prawns (no coastline!). Interestingly, charity shops in Russia are completely different to the UK, as there is no heritage of them. So having seen what other countries have done, they have reinvented the concept – a much more modern, young and fashionable feel (again, primarily run by young people). The following day was an early start, with a business breakfast and filmed interview with the Siberian social entrepreneur network Smart Concept, which is shown below. It turned out that they were due to hold a Festival of Social Entrepreneurship in Novosibirsk that weekend. I was asked lots of questions, but the one that surprised me most was ‘What do you think of Jamie Oliver?’ Obviously celebrity chefs get coverage the world over. We then did a filmed tour of featured social enterprises. All were run by hugely enthusiastic young people and included both a Dog and a Cat Café (not together!) as well as charity shop. Interestingly, charity shops in Russia are completely different to the UK, as there is no heritage of them. So having seen what other countries have done, they have reinvented the concept – a much more modern, young and fashionable feel (again, primarily run by young people). After a very late lunch, we got a taxi to the district outside Novosibirsk to a place called Akademgorodok. It is a purpose-built science university, built in the woods in the 1950s, designed to attract young scientists, enticed by the relative academic and lifestyle freedoms being so far from Moscow. 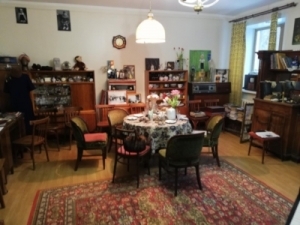 Over a ‘soft vodka’ and herbal tea, we discussed how people lived in this community in the time of the USSR in the ‘living museum’ of a local academic’s house. She has set the apartment up with typical Soviet 1950 furnishings as a replica of the early days of the institute as well as collecting a huge level of knowledge and artefacts from the 50s and beforehand (even dating back to the last Tsar). It appeared that collecting these items and indeed finding them is relatively rare in Russia. She was very impressed with my vintage 1920s brooch. On my final Siberian day I visited Margarita Semikova, who runs the Constellation of Heart Foundation. Margarita is a driven, enthusiastic woman with a strong business sense and set up the NGO that links companies to volunteering opportunities and training opportunities as part of their CSR. As with many NGOs it seems that there are rich benefactors on the Board. 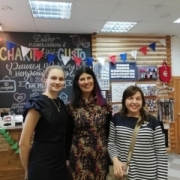 In this case the Board member had bought and paid for the renovation of a property in a shopping centre the middle of a very trendy student area in Novosibirsk. The property had originally contained many spaces for NGOs, including a training suite, café and shop. However, the local authorities decided to raise the ground rental overnight, so much of it had to be reconverted to commercial space to bring in the income to cover costs. It’s Margarita’s desire that this will all be reconverted once business is better. Impressively, more than 50% of the income is earned – the closest I’d seen to a sustainable social enterprise model – but it just goes to show how fleet of foot you need to be in Russia to address the next challenge. But Margarita is a determined woman! Following my trip to Siberia, Irina and I travelled back to Moscow to meet our fellow PeerEx colleagues, who had mainly been in Moscow and St Petersburg (except Kate Welch, our eminent Social Enterprise Mark Ambassador, who had been in Nizhny Novgord!) We were greeted as the survivors – because we had been in Siberia. Irina gave me a t-shirt which I wore saying ‘I’ve been to Siberia and survived’!